Cellist Robin Nelson, aged 16 and a pupil at Fortrose Academy is the Highland Young Musician of the Year after winning the competition held on Monday evening at the Drummossie Hotel. Fellow pupil and cellist Stephen Laidlaw was runner up while Nairn pianist, Bethany King , 13 years old was named most promising talent. The other two finalists were clarinet player Erica Sinclair (16) from Thurso High School and trombonist Alister More (16) from Tain Royal Academy. 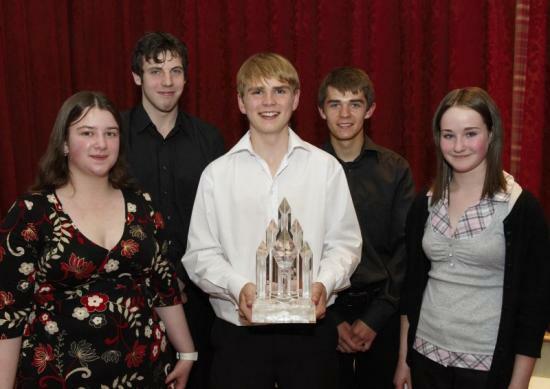 All five young musicians currently perform in Highland Regional music groups. The Highland Council's Music Development Officer, Norman Bolton said: "The standard of performance at Monday evenings competition was extremely high and the judges had a genuinely difficult time in making their decisions. Music making in all its forms continues to go from strength to strength in Highland schools which is a great credit to staff and pupils alike."